Weather: Hot and Muggy, 91; Ticket Price: $95 (Face), Parking: Free! As I was reviewing my 2015 football schedule with some buddies, one of them noted he already had tickets for this game. And then, Que (see Army, Michigan State) chimed in that he’d be up for that game also. Despite this not being a night game in Death Valley, I quickly reshuffled my schedule to accommodate this game to hit what we hoped would be a classic SEC game. 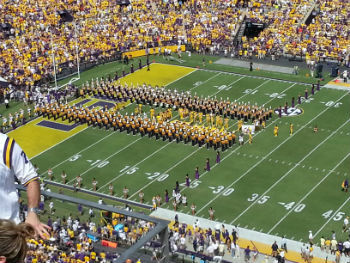 Tiger Stadium is a massive structure, seating over 100,000 at capacity. I normally buy tickets for these games from scalpers because the deals are usually much better than what you can get online. Just in case, I started tracking ticket costs in earnest a few days beforehand as our crew had grown to four. By late Thursday, it was mostly upper, upper deck seats left running at about $100 each. I know some folks in Baton Rouge, but nobody was able to get us a local deal. I had also been told by opposing Original Four competitor Pat that since this was the home opener and against Auburn we should secure our tickets beforehand because….”it’s going to be a real hard ticket to get.” I started to get nervous and bounced some options around with the guys, at one point considering very nice lower deck seats at $150 a pop. That was too rich for some the other guys’ blood. It was also rightly pointed out that this game had the real potential to be a massive blowout after Auburn nearly lost to the lower tiered Jacksonville State the week before. I kept watching prices Friday night and locked in seats in the bottom of the upper deck that would be at some point be in the shade. I paid face value for them and I felt pretty good about getting four together in that spot with seatbacks for $95 each. After a disastrous experience at Clemson, I know better than to buy at the top of the bowl. 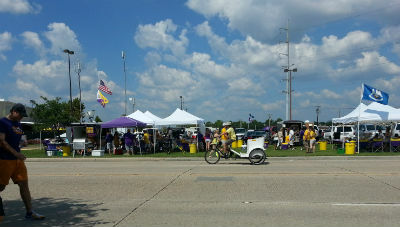 So with our crew of four, we planned to participate in the legendary LSU tailgating. Unfortunately, we planned poorly. 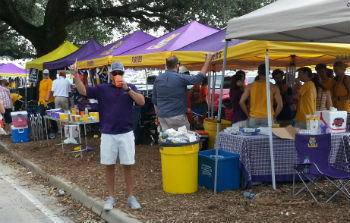 Sure, we had all the requisite stuff: burgers, dogs, chips, beer, etc., but we didn’t really research where to tailgate at LSU. And that, apparently makes all the difference. Anyone can buy tickets in advance for some of the tailgate lots for $40 or come really early and get some choice free ones. Since we came from Houston that morning our only real option was to park in the free lots. I was pretty fired up when I saw that because that is a very, very rare occurrence. Little did we know that “free” translates to a barren wasteland of cars. 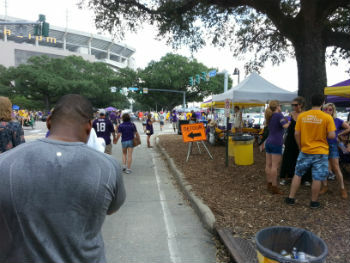 In my humble opinion, the real Death Valley at LSU is the free Levee Lots. There were some folks tailgating, but in general it was very weak. We had a great spot in the grass with lots of room but no one to enjoy it with. And even as we walked to the stadium, we really didn’t see that much and even when got really close, I’d say it was only average. I can hear Tiger fan already saying that I went to the wrong spot, and it is much better on the other side, blah, blah, blah. I get it, but it is not like we parked in a shuttle lot five miles from campus. 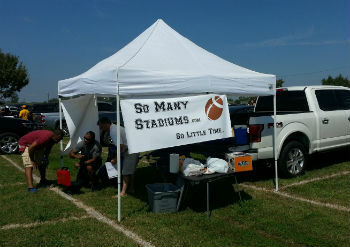 At this point, I have been to just shy of 50 stadiums, and at the upper echelon, the tailgating is everywhere. Shoot, I had better tailgating at Miami of Ohio for crying out loud. 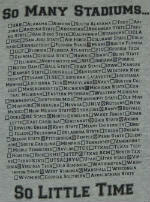 Again, certainly some of the onus is on me for poor planning, but really I couldn’t have been more underwhelmed. As we walked to the stadium, it was time to test the true cost of tickets. About 50 yards from the gate, we could have got two pairs of upper deck tickets for $40 each. Doh! Worse at the gate, we came across a guy willing to sell us four together for $20 each. @#$?@!!! 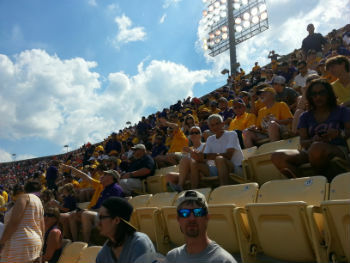 I tried to convince the guys that our seats were still better but I think they knew it was the second time that day we had fallen for the LSU over-hype. It was a painful reinforcement that if you can tolerate a little uncertainty up to game time, scalpers are always your best value for money. The stadium itself is very nice. The seats are roomy enough and with three beautiful video screens, you never miss any of the action. The fans, too, were great. I was a little worried that the staggering coed from Auburn clinging to me through the ticket line was going to shower me in vomit but thankfully, she kept it together. 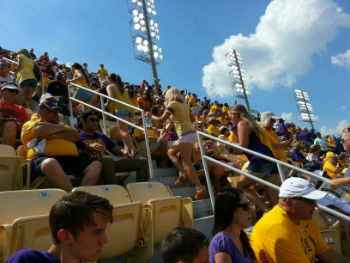 The LSU fan I was sitting next to was a much cooler customer who could handle his occasional nip of Wild Turkey without issue. He was kind enough to offer me a sip as well – score one for southern hospitality. The fans were loud and into the game. I heard enough side bars to know that they were knowledgeable as well. They didn’t pick on any poor Auburn fans in our vicinity. I guess the beating on the field was punishment enough. I did not sample anything from the concessions, but we did see that they had dirty rice. That alone is enough for me to give it a “thumbs up”. I picked up my traditional souvenir cup for $6.50 but alas no free refills. With the heat we were suffering through, I would have probably paid ten times that. On the plus side, I only had to make one pregame pit stop at the restroom. Apparently, I was sweating away the tailgate beers with no problem. There was nothing of note on the bathrooms themselves that I could tell, but it was not like I was going to linger to further evaluate the aesthetics. With all those sweaty guys, urinary efficiency is the key. I don’t really recall any specific traditions per se. I was told that this version of the actual live LSU Bengal tiger does not like to go into his cage. 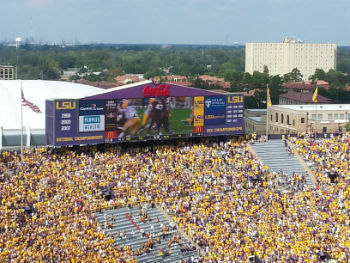 Wisely, the LSU folks know enough to let sleeping tigers lay (or is it lie or lain?) so there were no players running by the tiger. Getting to the LSU campus was fairly simple. Que drove us in his new truck and we had no issues. We did leave fairly early from Houston and we would have missed most of the stadium traffic if not for the pick-up point for our tickets. Our craigslist provider had us drive past LSU to get the tickets. We collectively groaned as we saw all the traffic we were going to face when we would turn back around. The ticket man did help us out by giving us a back way to the stadium which allowed us to miss most but not all of the traffic. The signage to the stadium was pretty good but we did rely on the GPS to find the infamous Levee lots. We got into the lot with a great spot and set up to partake in pre-game festivities. And then we waited. And waited. And waited. And waited for the good times that never came. It is important to recognize that it was stifling hot and crazy humid. This more than likely contributed to the increased ticket availability, reduced prices, and presumably the dearth of tailgaters. Or perhaps, LSU isn’t everything it was cracked up to be. 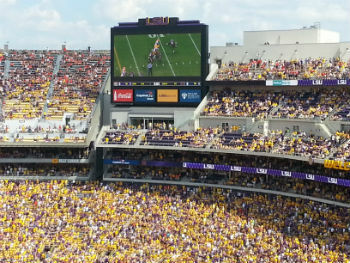 It is clear to me that one should not go to an LSU day game until mid-October at the earliest. There is a reason why the night games are so popular. Upon reflection, I guess I would say that I am abstaining from an overall assessment of the LSU experience. I do feel comfortable that it is not a guaranteed lock, top ten stadium. Perhaps with a night game and the purchase of (very) pricey parking pass and/or a full weekend dedicated to the experience, going to Death Valley becomes a legendary event. For us, it did not. I am not alone in that assessment. Fellow Original Four somanystadiums member, Momo, was similarly underwhelmed. On the other hand, the product on the field definitely exceeded expectations. 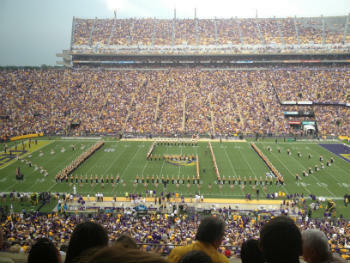 LSU football is a top tier program and one can only hope the visiting team brings their “A” game to Death Valley. Auburn did not and paid the price – seeing Fournette smash through their defense like a yellow and purple sledgehammer from hell. For me, that memory was worth the high price of admission. 5. Surprisingly…..the hotness level of the woman was below my expectation. I expected the hotness to rival UT or Alabama…..not even close….